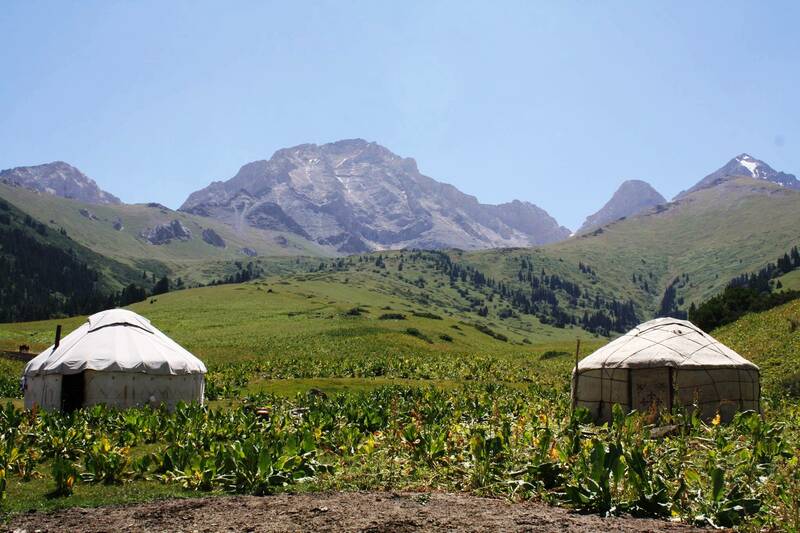 We offer a unique experience of living in an authentic nomadic setting in a yurt surrounded by towering glacier mountains. Kyrgyzstan is a photographer's heaven, and it is an ideal place for nature lovers and adventure seekers. We are family owned and operated, and we take great pride in making sure that our visitors have the best travel experience possible. A wood-burning stove serves to keep the yurt warm at night. One couple can stay in one yurt if there will be a large group staying. There is no electricity in the yurt; solar powered lanterns are used for lighting. The bed is made from thick cotton spreads that are layered on top of each other till it gets really soft and comfy. Early in the morning, it is hard to make yourself get out of the warm bed. Every guest is given a horse to use for transportation purposes from the time of arrival till departure. All meals are prepared at the yurt camp, and the choices are generally limited to nomadic Kyrgyz and Central Asian cuisine. We are working on a menu for our vegetarian travelers. Since we raise our own livestock, including milking cows, all of our dairy products are fresh and organic. As for the meats, we have goat meat, mutton and beef available on the yurt camp for steaks or any other meals. Also, something very unique to Kyrgyz culture is kymyz. Kymyz is a fermented drink prepared out of mare's milk that is very popular among local Kyrgyz people.